The ‘waterproof city’ is robust and resilient with a mix of paving and vegetation. The focus is on adaptive measures whereby rainwater is captured and drainage is delayed. The Dutch government is also preparing for the consequences of the rising sea level, land subsidence and rising temperatures with a combination of infrastructure works (e.g. dikes) and building with nature (restoring ecosystems in flood areas — the tidal park programme). These actions are included in the annual Delta Programme. The changing climate will lead to more frequent extreme rainfall and heavier downpours. This will increase the risk of disruption and damage caused by flooding, particularly in areas that already have a water storage capacity deficit and densely built-up, paved urban areas. The drainage and storage capacity of the urban water system is being adapted to deal with extreme rainfall. The ‘sponge function’ of the city will be restored by taking measures to capture and store rainwater where it falls and to delay drainage. These measures include green roofs and façades, less paving and more vegetation in public streets and neighbourhoods, water squares and infiltration zones as infrastructure. These measures will be especially effective in highly populated, built-up areas with little open space. The main priority in outer-dike Rotterdam is multi-layered flood protection based on adaptive construction and design: e.g. ‘flood-proof’ buildings, 'flood-proof' public areas, floating communities and ‘building with nature’. Special attention is being paid to the port and essential infrastructure, which are well protected from flooding. The protection of inner-dike Rotterdam focuses on prevention. Storm surge barriers will be optimised and dikes reinforced as needed and made multifunctional, to merge into the city as e.g. recreational routes, natural embankments or as part of new development. Climate change adaptation can easily be combined with improving the ecology of the city. More water and vegetation, ‘greening’ the city, will make it more resilient in periods of extreme rainfall or drought. In the tidal park programme, several outer-dike areas are being developed with alternatives to solid constructions to prevent flooding at high water levels. In this way various wetland-related ecosystem services are being restored: water storage, water flow regulation, and water filtration. Green banks improve the quality of the water, make it easier to enjoy these areas and improve ecological connectivity. In parts of the city where there is more space, increasing the water storage capacity of canals and lakes and constructing green-blue corridors will significantly contribute to making the city climate-proof. This green-blue adaptation of the city is a ‘no regrets’ measure — one that will help make the city climate-proof and make it a more attractive and pleasant place in which to live. Working together: partners in climate change adaptation should include municipal services, other government departments such as the water boards and Rijkswaterstaat, the citizens of Rotterdam and private organisations such as housing corporations, project developers, utilities and the Port of Rotterdam. The implementation approach is not a blueprint listing measures to be implemented in each area. However, it does give an indication of the priorities. Implementation is in tune with the ‘rhythm of the city’: renovation or replacement of buildings and infrastructure occurs on average every thirty to fifty years. This timeframe is fine to adapt to climate change. The implementation is area-specific: specific measures have to be developed for specific areas in the city. Rotterdam has more than 130 000 m2 green roofs. 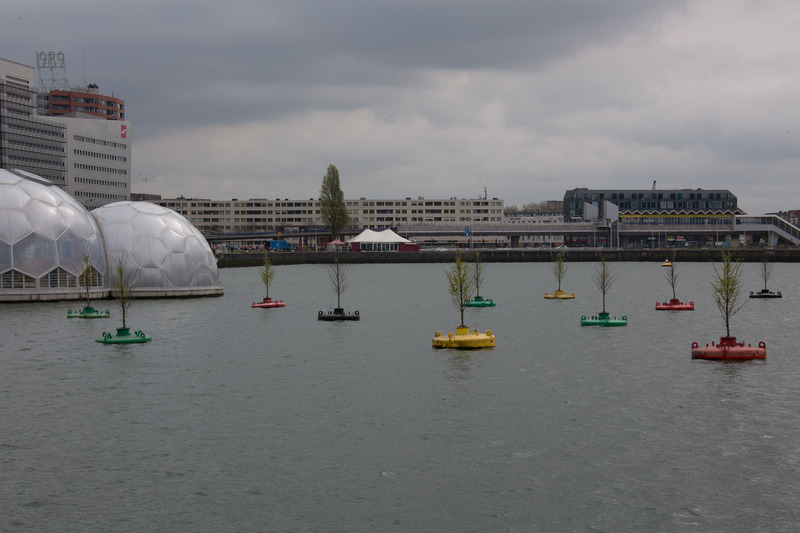 The Ecorys study shows that making Rotterdam climate-proof will require investment of EUR 4 to 5 billion (2010). Benefits, such as economic development, better spatial planning, nature, safety and lower insurance costs are being studied at present. The study results are expected to be published in 2018.